Well Easter is coming and the bunny is getting fat… or something like that. So my mind has naturally turned to what crafty things I can make for the weekend where all diets are officially off. I decided that decorating eggs was the way to go – I love what Alisa Burke did to these eggs but I’ve already done doodling so I thought I’d give dyeing a go. 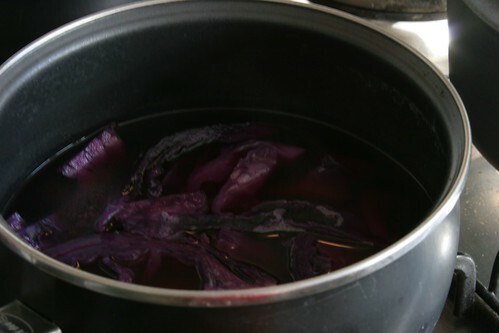 I decided to use what I had to hand around the house to make the dyes – it was fun making the concoctions and conducting a chemistry experiment in my kitchen. I used these instructions and I tried spinach, coffee, red cabbage and brown onion skins with varying results. 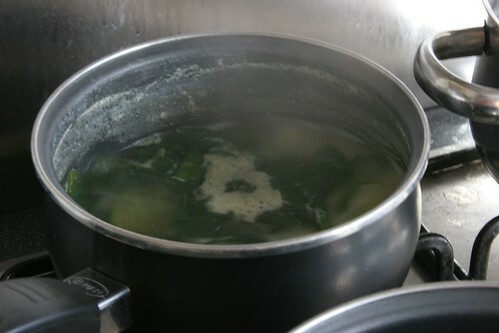 Spinach – the resulting liquid was barely yellow. I didn’t even bother using it. I think I needed to use a lot more spinach and boil it for longer. Coffee – no boiling required. The resultant eggs were a nice soft brown. Red cabbage – the colour took a long time to develop on the eggs but when it did it was a pretty blue. 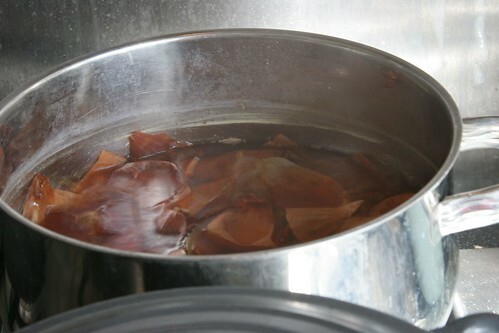 Onion skins – my favourite result: a lovely orange. I tried a couple of effects. On some I used wax crayon to draw designs to resist the wax. And I had a great result with masking tape on one of them too. 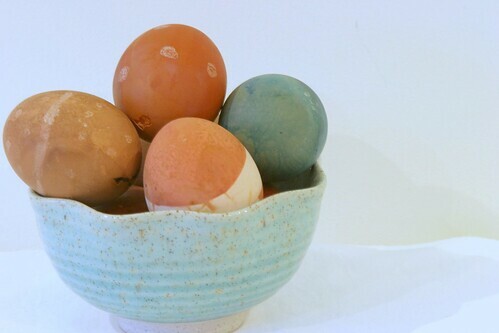 Have you experimented with dyeing eggs naturally? How did you get on? If you use electricians tape (I’m not sure that’s what it’s called in english, the tape you use to re-insulate wires) it works a lot better because it’s a bit stretchy, so you don’t end up with “ruffles” on the edges. If you think it’s too wide you can just cut it in half lengthwise. 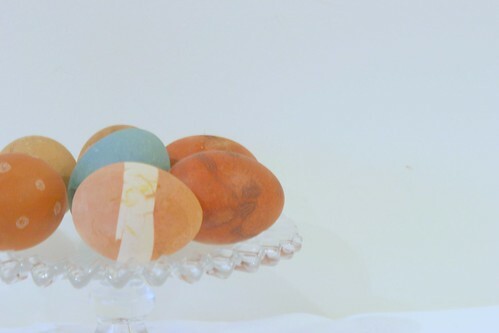 Try using more than one color to kind of tie dye the eggs (electric tape in one spot, then a light color, then another tape and a color that’s darker,…) I did that last year and they were a huge success.